Native Treasures of New Mexico sells Native American Jewelry, Pottery, and Kachinas. We buy direct from local artisans throughout New Mexico and the Navajo Nations. 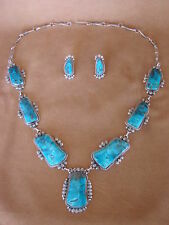 Navajo Indian Jewelry Turquoise Squash Blossom Necklace Set Louise Yazzie! Native American Jewelry Handmade Sterling Silver Turquoise Bear Paw Pendant! Native American Indian Jewelry Sterling Silver Turquoise Dot Post Earrings! Native American Sterling Silver Hand Stamped Wolf Turquoise Pendant! Navajo Indian Jewelry Sterling Silver Turquoise Bear Paw Dangle Earrings! Hand Carved Rainbow Calsilica Hummingbird Fetish Necklace by Matt Mitchell! Navajo Indian Jewelry Handmade Sterling Silver Feather Ring, Adjustable! 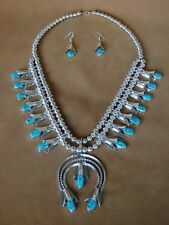 Zuni Indian Jewelry Sterling Silver Turquoise Sunface Post Earrings! Navajo Indian Jewelry Copper & Spiny Oyster Cross Pendant! Handmade! 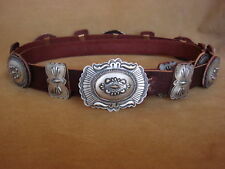 Navajo Native American Jewelry Handmade Copper Bracelet Elaine Tahe! Native American Jewelry Copper & Turquoise Bracelet by Skeets! Native American Jewelry Sterling Silver Lapis Post Earrings by Joe! Native American Indian Jewelry Hand Strung 3 Strand Coral Necklace! Small Native American Indian Jewelry Sterling Silver Turquoise Post Earrings! Navajo Indian Sterling Silver Howlite Slab Earrings!